The wedding cake is often the centerpiece of the joyous occasion. 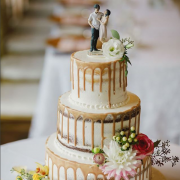 Did you know that cutting the cake was found to be as important as the first dance or even exchanging vows? 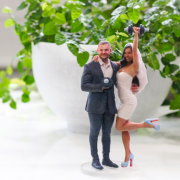 What if you could make your cake even more unique with your very own custom 3D printed cake topper! 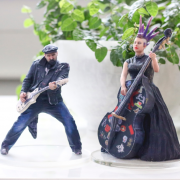 When you come to the studio – there are no rules for what should go on a cake. 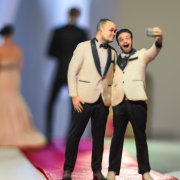 We often have couples in their dress and tuxedo step into the booth, but many opted for the more personal looks outside of the traditional topper. 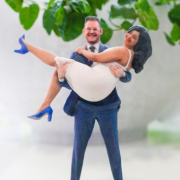 OUR CUSTOM CAKE TOPPERS WILL BLOW YOUR GUESTS AWAY. 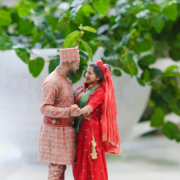 TAKE YOUR WEDDING TO THE NEXT DIMENSION!